A home packed with detail and delight! At homify, we believe that the beauty is in the detail. A gorgeous lamp here or a piece of antique furniture there can set your home apart from all the other homes on the block. 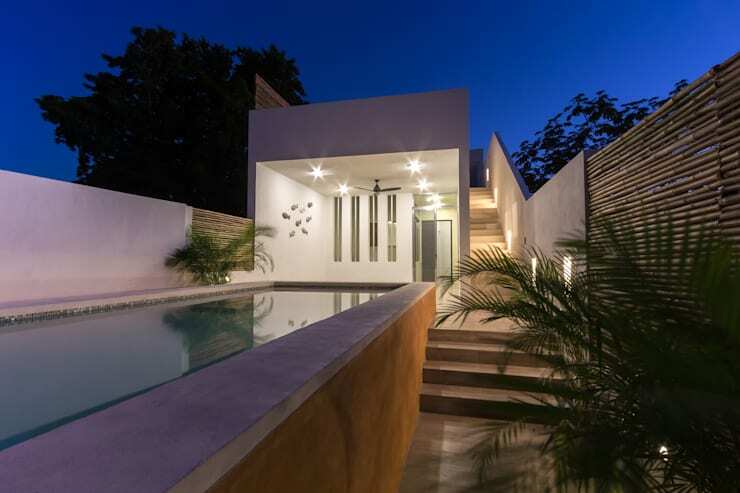 Today, we are going to witness how the professionals do it by exploring a unique, quirky and beautiful home, designed by Cervera Sanchez Arquitectos. As Vitruvius said, Consistency is found in that work whose whole and detail are suitable to the occasion. It arises from circumstance, custom, and nature. Let's go and explore just how suitable this home is for its purpose. From the outside, we can see that this is a simple and small home, yet it exudes a very sophisticated and elegant air. 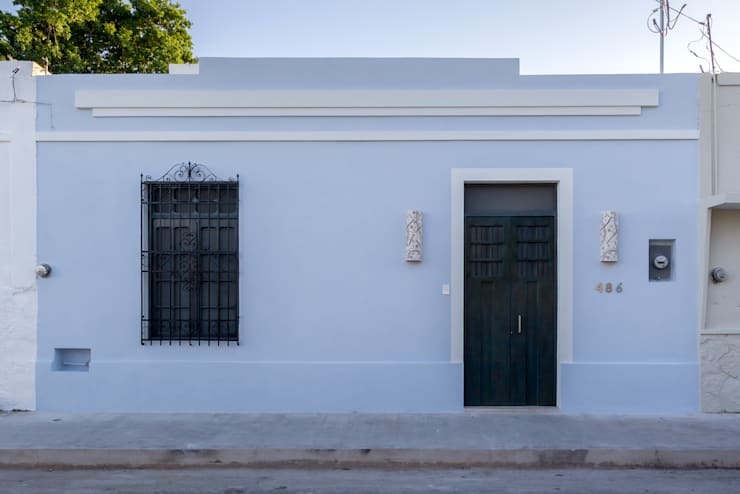 The designers have achieved this by contrasting a soft, pale blue facade with a colonial look and feel. Don't you love the very dark wooden door and window frames as well as the black wrought iron bars across the window? These look very dramatic and savvy next to the pale blue walls. The attention to detail comes into play right from the get go. The designers could have gone for plain, standard bars across the windows as they are a functional element. Yet, they have gone for a gorgeous design that enhances the facade – a great tip to note! 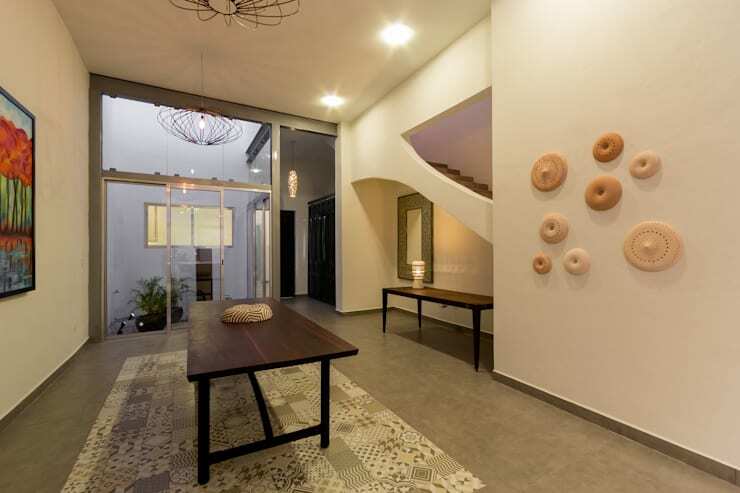 The little lamps on the wall, which flank the front door, are also functional elements yet the designers have paid close attention to them. They are soft and detailed, with patterns across them. They are like the cherry on top of the beautiful facade! If we head inside this home, the interior design is even more impressive than the exterior. The living room is detailed, yet incredibly minimalist with only necessary items on display. If you have a small home, this is a great design to go for. Look at how spacious and airy this room is thanks to the lack of clutter. There are only one simple table and two armchairs in this room – all that you really need! You'll also notice that the designers haven't gone for very chunky or bulky furniture in an effort to keep this room looking light and spacious. The detail is introduced in the form of a patterned floor, which enhances the whole space and works so well with the simple furniture. 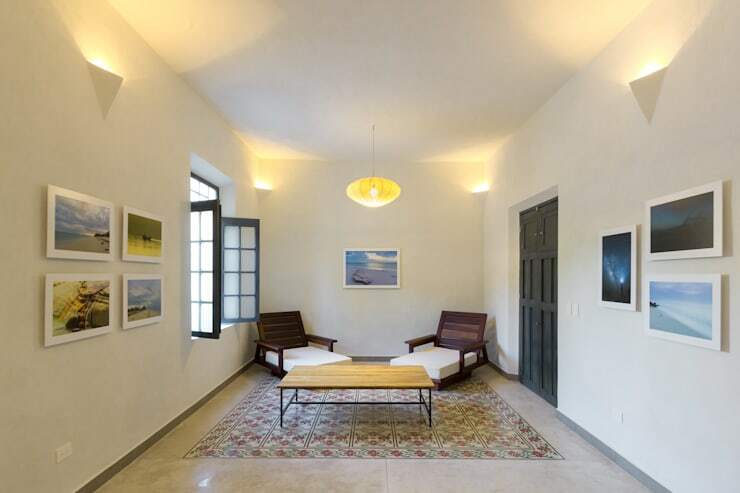 On the plain white walls, we can see that carefully selected pieces of artwork have been hung up. This adds a personal touch to the space, without overwhelming the room. The open plan design of this space makes the home seem so much bigger than it really is. Would you believe that the entire space is only 220 square meters? 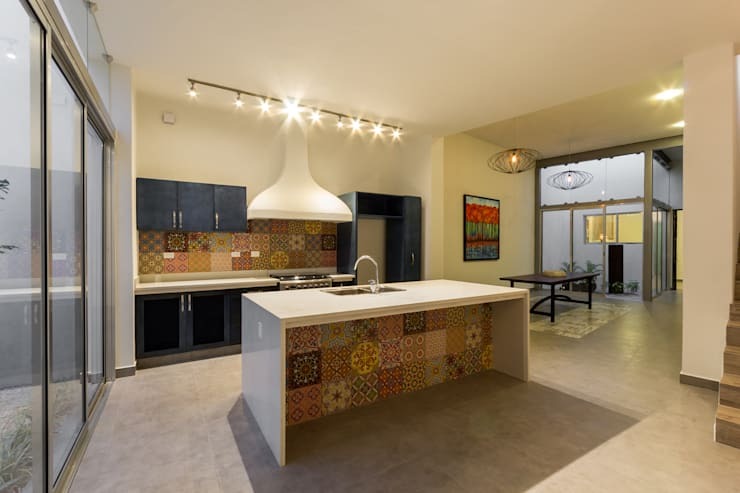 The designers have used light, neutral colors throughout the interior design to create this spacious ambiance. They've paired this with large glass sliding doors and high glass windows, which allow sunlight to filter into this space. It also extends the living space into the exterior space, opening the home up. Don't you love the industrial flooring, which also introduces the patterns that we experienced in the other room? On the white walls, we can see little arty detail – again showing us how the designers have paid attention to every little piece of furniture and decor item in the home. If you step outside into the exterior space, you can see just how much natural light plays a role in this home! The designers have created a little garden area, giving a natural decorative touch to this space. It also breaks up the interior space and creates a seamless transition between the interior and the exterior. 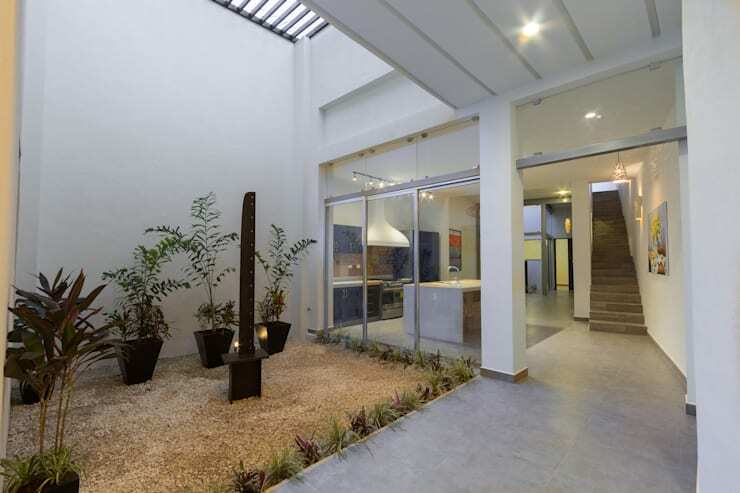 Even the garden is carefully designed and landscaped, bringing a very unique, neat and tidy creation to the space. Natural light is so good and healthy for a home. It not only opens it up, but it naturally warms a space so you don't have to invest in too many artificial heaters or lights in winter! Have a look at these tips for bathing your home in natural light. The kitchen is so warm and inviting, it's difficult to leave! It flows into the rest of the home, creating a very social and interactive space for the whole family. A kitchen island in the middle of the room provides a space for sharing coffee, doing homework or even an extra surface for preparing food. The designers have placed gorgeous patterned wallpaper in strategic spots in the kitchen, enhancing the design without it becoming too overbearing. It works beautifully with the white and navy blue kitchen colors. Kitchen lighting is key! You want it to be bright enough so you can see what you're cooking, but you don't want it to be too bright that the space feels like a clinic. Don't you think the designers have achieved a perfect balance here? You'll notice that the kitchen also takes on a minimalist design thanks to the kitchen cupboards and drawers, which store all unnecessary condiments, cutlery and crockery neatly out of sight. Have a look at these 6 smart kitchen storage solutions. We end off our tour outside, where the small home that looked so simple and unassuming from the front flows into an incredibly sophisticated and savvy terrace and pool area. The designers have maintained the neutral tones that we've seen throughout the interior of the home, which create a very modern ambiance. They've also ensured that they make the most of the length of space available to them, building a very long pool that you could swim laps in for hours. The terrace is the perfect spot for enjoying the evening stars or relaxing in the shade during the summer months. A few plants here and there bring fresh, natural decor to the overall look and feel. As Charles R. Swindoll said, The difference between something good and something great is attention to detail. Would you want to live in this little haven?